Ease and style in a single garment! Bliss by Code Happy™ brings you Men's Drawstring Cargo Pant that is fashioned to deliver you a professionally compelling look. Adjustable drawstring of the natural rise pant with tapered leg allows for ease of wear at your perfect fit with easy mobility, bending and squatting. Constructed using CERTAINTY® Antimicrobial Fabric Technology, the comfy yet sturdy apparel minimizes stains and odors due to bacteria. 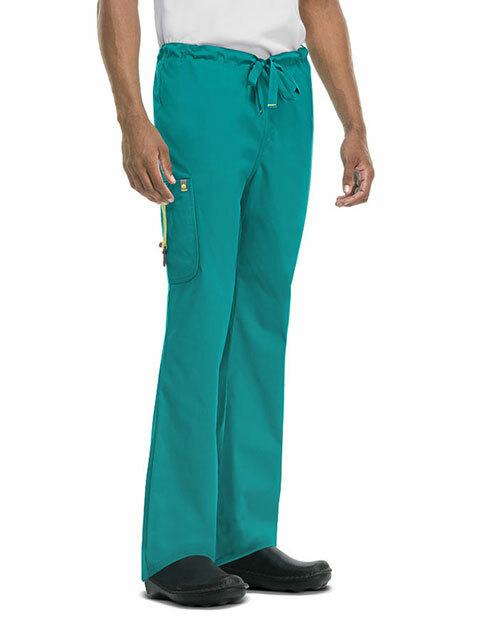 A sectional double cargo pocket featuring a key clasp and hidden tape, and a back pocket keep your nursing items and personal essentials securely in place with quick reach to them. Double needle topstitching enhances the durability of the soft, lightweight garment.